Turn back the effects of time with the Olay Regenerist Eye Lifting Serum. It's a unique soothing serum which works to iron out fine lines and wrinkles for a more toned, supple skin texture. 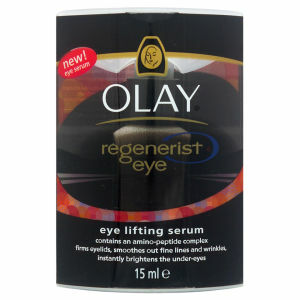 It uses an amino-peptide complex to reduce the sagging of the eyelids, resulting in a more awake, brighter appearance. K.D. When applying Regenerist Eye Lifting Serum to the sensitive eye area: apply the cream to the tip of your ring finger and lightly pat into the skin under and around the eye area. Your ring finger is the weakest finger, so exerts the least pressure on the eye area. Aqua, Cyclopentasiloxane, Glycerin, Polymethylsilsesquioxane, Dimethicone, Niacinamide, Dimethicone Crosspolymer, Stearyl Dimethicone, Propylene Glycol, Panthenol, Titanium Dioxide, Butylene Glycol, PEG-10 Dimethicone Crosspolymer, Mica, Tocopheryl Acetate, Petrolatum, Sucrose Polycottonseedate, Camellia Sinensis, Cucumis Sativus, Palmitoyl Pentapeptide-3, Bis-PEG/PPG-14/14 Dimethicone, PEG-10 Dimethicone, Cetyl Ricinoleate, Allantoin, Cyclotetrasiloxane, Tocopherol, Canola Oil, PEG-100 Stearate, Disodium EDTA, Iron Oxide, Biotin, Benzyl Alcohol, Phenoxyethanol, Butylparaben, Ethylparaben, Isobutylparaben, Methylparaben, Propylparaben, BHT.